Podsadka was a secret plan to use a two-launch scheme to shoot the first Soviet crew around the moon. The reason for the puzzling Soyuz manned launches in 1966-1969 are revealed to be tests of this scheme. The effort was bandoned after Apollo 8 orbited the moon and the L1 program was cancelled. In 2004 Pesavento and Vick assembled evidence for the use of the podsadka alternative for Soyuz 7K-L1 (L1) manned circumlunar missions. The baseline (and officially, only) L1 flight plan was direct flight: Chelomei's Proton-K (UR-500K) booster would place the Proton 11S824 (Block D) translunar injection stage and L1 with a crew of two into a low earth parking orbit. The Block D would then fire to place the L1 crew on a circumlunar (loop around the moon) trajectory. The L1 spacecraft in this scenario had a gross mass of only 5300 kg compared to 6850 kg for the full-up Soyuz 7K-OK. The reduction was achieved largely by deleting the forward orbital living/airlock module of the 7K-OK. The podsadka alternative involved launch of an unmanned L1 spacecraft and Block D stage into a low earth orbit by a UR-500K rocket; launch into that orbit of a Soyuz 7K-OK manned spacecraft with three crew by a Soyuz 11A511 rocket; rendezvous or docking in low earth orbit between the Soyuz 7K-OK and L1-Block D; transfer of two of the Soyuz crew to the L1; then firing of the Block D stage to put the L1 on a translunar trajectory. When the scheme was first conceived (since Korolev had sold the L1 based on a single launch of the spacecraft by a UR-500K, in replacement of Chelomei's scheme for a single-launch mission using the UR-500K with Chelomei's own LK-1 spacecraft). How seriously it was pursued. Nature of the docking system (if any - Pesavento and Vick speculated that an inflatable airlock was fitted to the front of the L1, and the cosmonauts would free-float from the 7K-OK to the nearby L1). When the idea was abandoned. It turns out Korolev conceived of podsadka over a month before before the UR-500K-L1 was authorized. Initial calculations by OKB-1 showed that the developmental L1 would have a dry mass of 4641 kg, or 4847 kg after delivery of cosmonauts via podsadka. On the other hand, Kolyako in Division 2 estimated the translunar payload of the Block D as ~ 5000 kg in the single launch scenario, or ~ 5300 kg in the podsadka scenario. 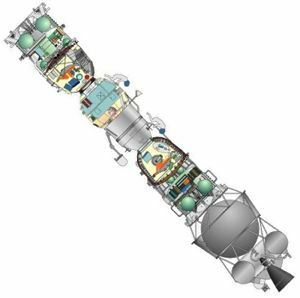 Following discussion on 15 Sept 1965, Korolev made the decision on 16 Sept 1965 that the L1 would be a single-design spacecraft, capable of being used in either the direct flight or podsadka schemes (1-178). At some point thereafter, it seems the version for podsadka was designated L1S (perhaps for L1-stykovky, L1-docking). So we have on 12 March 1966 (1-220) discussion of L1S Docking Complex / Landing System tests (Leave factory December 66; arrive test point January 67; Independent testing from March 67); and on 18 March 1966 (3-9) a message from BE Chertok on the development of Earth-to-Space equipment for the 7K-OK, 7K-L1, and 7K-L1S. After Korolev's death in January 1966, on 23 March 1966 (1-226) acting director Mishin held a brainstorming session with this top managers to address "...our inconsistent lunar program." He noted alternatives that could be pursued: "1. Return to a two-launch scheme (podsadka, as baseline); 2. Keep with direct flight; 3. Use a Block D with storable propellants (perhaps a reference to the stage Chelomei had already been developing for the LK-1); 4. Use the 7K-OK as the designated return spacecraft." (This is perhaps a reference to a 1965 two-launch Soyuz-PLK scheme (1-34, 1-166, 1-169), involving launch of a complete 7400 kg Soyuz-PLK which would dock with a translunar injection stage. Perhaps in this 1966 version a fully-fueled Block D would be launched by Proton, followed by a Soyuz 7K-OK launched by an R-7 11A511 booster. After docking, the Block D would fire, sending the docked assembly on a translunar trajectory.) He noted that the L1 program was "a diversion for the bureau" to the core objective of landing a cosmonaut on the moon (the L3 program). Among the advantages of continuing with the L1, he noted that it "Utilizes the 7K-OK" - evidently there was no purpose for the spacecraft beyond the L1 mission in the podsadka scenario. He asks for frank opinions from his managers. V Rauschenbach noted that they "..have to do the L-1 ... and therefore we will have to use a 2-launch scheme based on the L1-S." BE Chertok: discussed the rendezvous and docking systems for the various spacecraft: "L1-S - 'Igla'; LOK - 'Kontakt' (since 'Igla' cannot be used on the LOK (due to mass considerations); or a new system for the LOK." So here we have an indication that the L1 podsadka version did use the Igla system, which makes complete sense, since the Soyuz 7K-OK missions conducted dress rehearsals for podsadka using this system to rendezvous and dock two 7K-OK spacecraft in earth orbit. So the docking system for podsadka and the rationale for the first Soyuz flights (through Soyuz 5) is revealed. Block D deliveries: 1 unit 15 Sept; 1 unit 15 Oct; 1 further unit in October; and 1 unit per month thereafter. No 1 - August - Proton-2 (this may refer to the Proton / Block D full-mass mockup that was tested in October 1966 but then abandoned for safety reasons). This indicates that podsadka was the baseline approach for early circumlunar missions, for both safety and launch mass considerations. Only the last five missions would be direct flights. It was probably anticipated that by then the Proton booster would be reliable enough and that improvements to the Block D and the weight reduction on the L1 would make the single-launch approach feasible. On 31 May 1966 Mishin makes a note for himself (1-284-285): "Get photos for VYa Litvinov of Blok D, 7K-L-1, 7K-L1S", indicating a commonality of theme for the L1 and L1S. On 22 July 1966 (1-234) DF Ustinov, Secretary of the Central Committee for Defence and Space, berates Mishin on the slow start on the program. He stated "Do not underestimate the successes the US program Gemini. You need to consider a staged program of space exploration. The pace of progress in KIS and TP facility construction will not support launches within the mandated timeframe." No 2P - 15 October & No 3P - October: Orbital flights with 2x (indecipherable) (1P, 2P and 3P were prototype L1's without heat shields and recovery possibilities). A few notes indicate continuity of the podsadka program to the end of 1966: (2 Dec 1966 (1-319): (discussion with) "NA Pilyugin - On the supply of (guidance) equipment for the 7K-L1S"; 6 Dec 1966 (1-252): Discussion with "YaI Tregub on 7K-L1 with crew delivery via 7K-OK"). Kamanin noted that podsadka was still the baseline approach at the State Commission meeting on L1 on 24 December 1966. By then the delivery schedule was at least three months behind the revised July 1966 schedule. In his diary on this meeting, Kamanin clearly describes the podsadka approach and states that the spacecraft will "dock", not rendezvous. He also notes the criticality of a Soviet man around the moon by November 7, 1967, the 50th Anniversary of the October Revolution. The first L1 launch (relatively successful, although with many system failures) came on 10 March 1967 with 2P being launched under the cover name Cosmos 146. However the next launch, 3P as Cosmos 154 on April 8, was a failure. There were multiple failures aboard the L1 and the Block D failed to fire, leaving the spacecraft in parking orbit. On 24 April came the space disaster that put the Soviet lunar program back several months. In a rehearsal of the podsadka scenario, 7K-OK number 4, designated Soyuz 1, was launched first as the active spacecraft with cosmonaut Vladimir Komarov abaord. Soyuz 2a, with a 3 man crew would launch the following day, with 2 cosmonauts spacewalking to Soyuz 1. Multiple failures aboard Soyuz 1 led to Komarov attempting a reentry the next day; he was killed when the spacecraft's main and backup parachutes both failed to deploy. Failure analysis and testing of a revised parachute system would take time, but by the next month Mishin was planning to launch an unmanned test of the docking scenario in July, followed by returning to the manned version in August. The successful flights of the UR-500K on the 2P and 3P flights, and the further 4 separate UR-500 launches provided confidence in the launch vehicle's reliability. The main delays with L1 development would be in relation to development by BTsVM of the Argon-11 digital computer for its control system. The failure of 7K-OK number 4 (Soyuz 1) indicated a delay in development of docking in earth orbit. Followed by circumlunar launches according to astronomical constraints (which would mean 23 August, 21 September, 19 October). Delays in requalifying the parachute system for both L1 and the 7K-OK stalled things throughout the summer. Finally L1 number 4L launched on 29 September; but the booster's first stage failed, although the L1's launch escape system pulled it away and the capsule was recovered 65 km from the launch pad. The next attempt, with L1 number 5S on 22 November 1967, also failed (2-90 - the 5S designation seems to indicate this was a test of the podsadka version of the L1). This series of Proton launch failures (later attributed to problems in transitioning engine production from the design bureau to the production factory) would further delay the L1 and provide grounds to continue the podsadka program to provide a safe way to deliver the cosmonauts to the L1 in earth orbit. Having missed the November 1967 deadline, and given the Soyuz 1 debacle, Mishin was in no hurry to return to manned flights of either the L1 or 7K-OK until all systems had been thoroughly proven. Problems continued to dog the L1 test program. Zond 4 / L1 number 6L March 1968 self-destructed during reentry when it was unable to conduct a lifting reentry; L1 Number 7L was lost in another booster failure in April 1968; 8L was lost when the Block D stage exploded on the pad in July 1968; finally Zond 5 looped around the moon in September 1968 and was recovered, albeit after a 20G ballistic reentry. Zond 6 in November 1968 looped around the moon, but the cabin depressurized in flight. It managed to make a lifting reentry but the parachute ejected prematurely, and the capsule crashed into the steppes, flattened to a pancake (and requiring a delicate dissection in situ by an OKB-1 team to remove the destruct charge - 10 kg of TNT). Meanwhile, Soyuz 7K-OK flights resumed, and demonstrated automated rendezvous and docking using the Igla system on Cosmos 186/188 in October 1967 and Cosmos 212/213 in April 1968. Finally Soyuz 2/3 flew as a demonstration with a single crew member in October 1968. The way was clear for the Soyuz 4/5 podsadka demonstration flight in January 1969, followed by the first manned L1 flight in February 1969. But this was all moot. The American Apollo 8 flew around the moon in December 1968, and with the propaganda value lost, the L1 looked too dangerous to continue. Manned L1 flights were abandoned, and after Soyuz 4/5 finally demonstrated the podsadka technique in January 1969, the 7K-OK was abandoned as well (the remaining spacecraft being used for other purposes). In conclusion, podsadka was the main scenario in the L1 program, from the very inception right up to the January 1969. 14 7K-L1's and 6 podadka 7K-OK's were built. And it seems that at least one podsadka 7K-L1S, number 5S, was flown. For podsadka, the Soyuz 7K-OK / Igla type rendezvous and docking system would have been used. Pesavento and Vick's concept for an inflatable airlock at the forward end of the L1 does not have any support in Mishin notes and would not be possible using the Igla docking system demonstrated on the 7K-OK. On the other hand Mishin never discusses the method the crew would use to enter the L1. The side hatch on the L1 capsule was available for crew entry by the removal of the backup parachute system. It would seem most likely that the podsadka L1 spacecraft would use an inflatable airlock on the side hatch, as demonstrated in the Voskhod-2 flight in 1965. An L1 illustration in the Kaluga museum may support this scenario. Another alternative would be an entry into a depressurized L1 through the side hatch without the airlock. It has been argued that Soviet avionics could not survive a cabin depressurization. However Zond 6 and Soyuz 11 both functioned after cabin depressurization; and the LK lunar lander would also have been depressurized during the crew transfer. The nature of the L1 side hatch remains open unless revealed elsewhere in a closer reading of Mishin's notes, or revealed by another source. L1S was the version of the L1 for docking with the 7K-OK in the podsadka scenario, as concluded previously. The version of the 7K-OK that would dock with the L1S was the 7K-OKT (2-52). The official RKK Energia history mentions the L1S in connection with the N1 ("...Flight tests of the N1 rocket with the simplified payload system L3 with unmanned spacecraft 7K-L1S instead of LOK and LK began in February 1969...") but this is not supported in Mishin's notes, which only use this designation in connection with the L1 flights, and never later in the notes when the N1 was the predominate concern. L1A was the version of the L1 spacecraft used for unmanned tests of the Block D version of the N1 in both earth orbit and lunar orbit (2-14; 2-25; 2-29). It had the article number 11F92 (2-12, 2-29). It consisted of the L1, plus certain other components of the LOK (guidance systems, fuel cells, forward thruster package) carried for in-space test. These varied from mission to mission. The L1A was necessary since the Block D stage, used for lunar orbit insertion and to take the LK lunar lander to just above the lunar surface, had no guidance system of its own. L1E was the name of the complex used for testing of the L3 version of the Block D in earth orbit, launched by the UR-500K (2-12). The L1E complex consisted of the L3 version of the Block D together with the L1A. The L1E was also referred to as the T1K in the earth orbit variant (with the test of the LK lunar lander in earth orbit referred to as T2K). L3S was the name of the complex used for testing of the L3 version of the Block D in lunar orbit, launched by the N1. The L3S complex consisted of the L3 version of the Block D, an LK mockup, and the L1A. All versions of the L3S known included the thruster package at the forward end of the L1A.